Create this decadent chocolate dessert from scratch or use mixes to make it super quick and easy! Whether you call it a Brownie Trifle or a Chocolate Punch Bowl Cake it’s a showstopper! Layers of fudgy brownies, creamy chocolate fudge pudding, cheesecake filling, and toffee are crowned with a cloud of whipped cream and garnished with more chocolate. It’s a make ahead dessert that’s absolutely addictive and it’s day 5 of #Choctoberfest. When I was a junior in high school that all changed. I began dating a boy who had recently moved to the United States from England and between the accent, the shyness, and the cultural differences I was totally head over heels in love. Once I met his mom – and totally clicked with her – it was pretty much a given that I was going to spend the rest of my days dreamy eyed listening to him talk. It was a given as far as I was concerned — the future had other ideas. Anyway, I spent a lot of time over there. A week or so before Christmas I was eating dinner with them and she put a glass pedestal dish on the table. Through the thin, transparent crystal I could see the most glorious layers of cake, fruit, custard, and whipped cream that I’d ever encountered. I knew that it was something like a punch bowl cake but I’d never seen ANYTHING like this. Being a neophyte foodie, well before I knew what it meant, I asked what this delectable concoction was and how to make it. And that, my friends, is history. Oh, and she is also the person that introduced me to quiche and Harvey’s Bristol Cream Sherry…. The main thing is that you want to make this asap because it’s delicious. 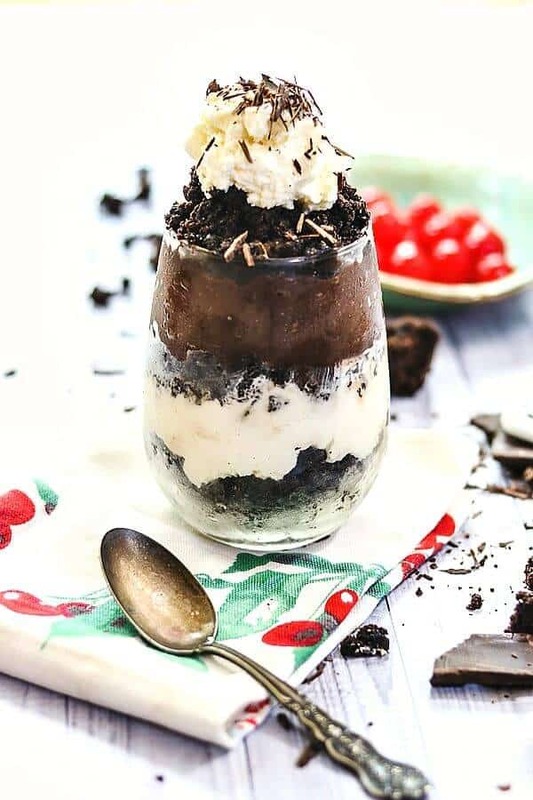 You can make this easy cheesecake brownie trifle recipe in wine glasses to serve as individual parfaits. How do you make easy chocolate trifle? Layer cake squares in the bottom of the dish. Sprinkle with some sort of liqueur if desired. Top with more cake layers and repeat, ending with whipped cream. The main idea is to make a lot of layers and make them pretty. Sometimes that’s easier said than done! What is traditional English trifle? 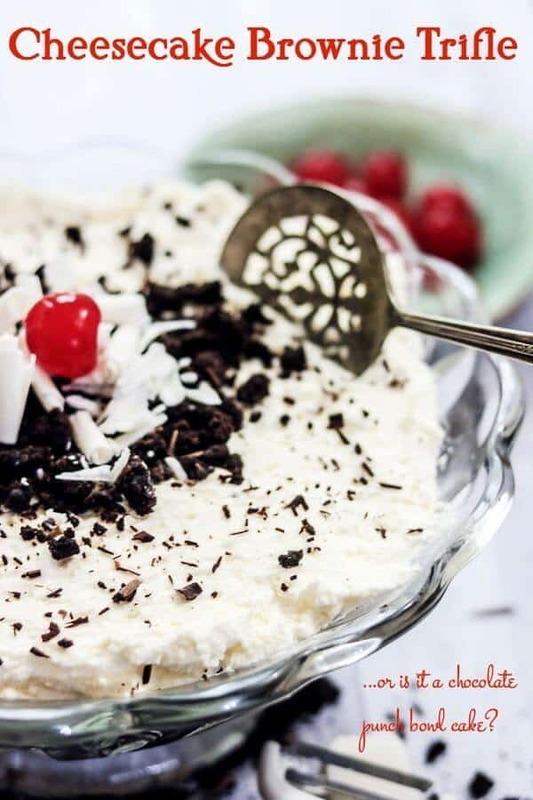 Tradition English Trifle is a layered dessert made with ladyfingers soaked in sherry, berries, custard, and whipped cream. My boyfriend’s mom also added a jello glaze over the fruit and she used poundcake rather than ladyfingers. Obviously, like me, she was a rebel. How long does trifle take to set? If you make it the traditional way with fruit and Jello then you’ll want to let it set in the refrigerator for at least two hours. I think pretty much ALL trifles are better if they’ve been refrigerated for a couple of hours, anyway. No. And seriously – this is so quick and easy to put together that there’s no real need to. You can make it a day or so ahead of time. Layers of fudgey brownies, chocolate pudding, cheesecake feeling and toffee are topped with whipped cream in this decadent chocolate dessert recipe. This is probably the easiest, most decadent chocolate dessert on the planet but there are a few ways to make it quicker and easy – as well as a few things you should know. You can make this in wine glasses as individual parfaits if you like – this is a great idea if you want to use a liqueur but children are going to be there, too. Just do part with and part without — and don’t mix them up! Make it super easy by starting with brownies from the bakery, pudding from the deli, and whipped cream in a can. It will take you about 5 minutes to put together. A straight sided pedestal dish is traditional for trifle and a punch bowl is traditional for punch bowl cake. They end up looking different but tasting the same. Either is fine. I think the trifle dish shows off the layers better. Let the trifle chill for a few hours in the refrigerator. If it’s adults only generously sprinkle the cake layers with Kahlua, Irish cream, rum, bourbon, port, brandy, sherry, or whatever you like. For this recipe Kahlua is my booze of choice. 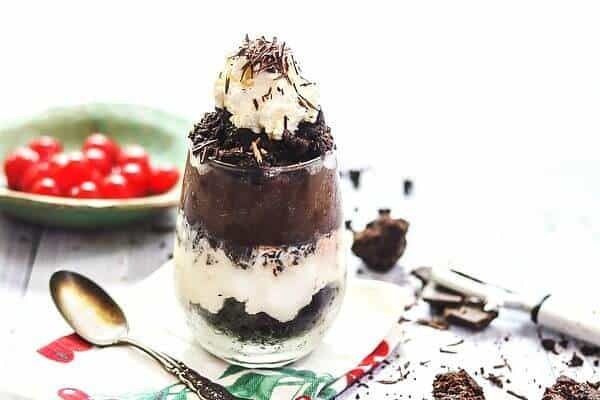 Brownie trifle can be made a day ahead of time and kept in the fridge. You can also make this with chocolate cake. Chopped Butterfinger bars are a nice variation for the toffee. Drizzle caramel sauce over the layers before adding the pudding. By making this into individual parfaits you can make some with liqueur for the adults and some plain for the kids! Do you prefer the British style with a traditional Trifle Dish or Southern Style with a punch bowl? Either way – this is one dessert to have in your “I need a amazing dessert stat!” file. In the South a trifle is often called a punch bowl cake. This decadent chocolate dessert is so easy and it goes together quickly. It’s fancy enough for the holidays and easy enough for potlucks and unexpected guests. You can even make it a day ahead of time! Be sure to read through the cook’s notes above for variations and tips. Please give this recipe 5 stars – thanks! 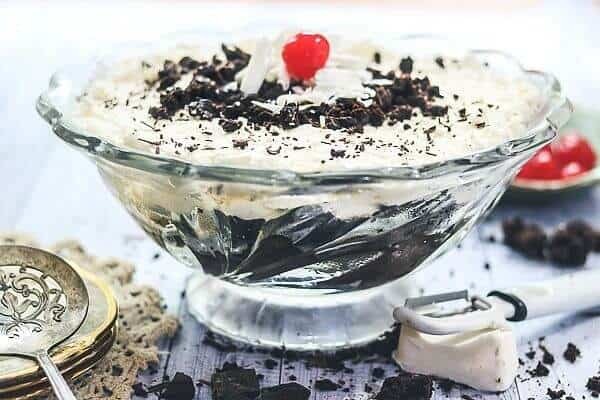 Fudgy brownies, creamy fudge pudding, rich cheesecake flavored pudding, and toffee are layered in a bowl then topped with a cloud of sweet whipped cream. It's a quick and easy show stopped of a dessert! Prepare brownies according to instructions in recipe or on box - let cool. Prepare chocolate pudding according to instructions in recipe or on box. 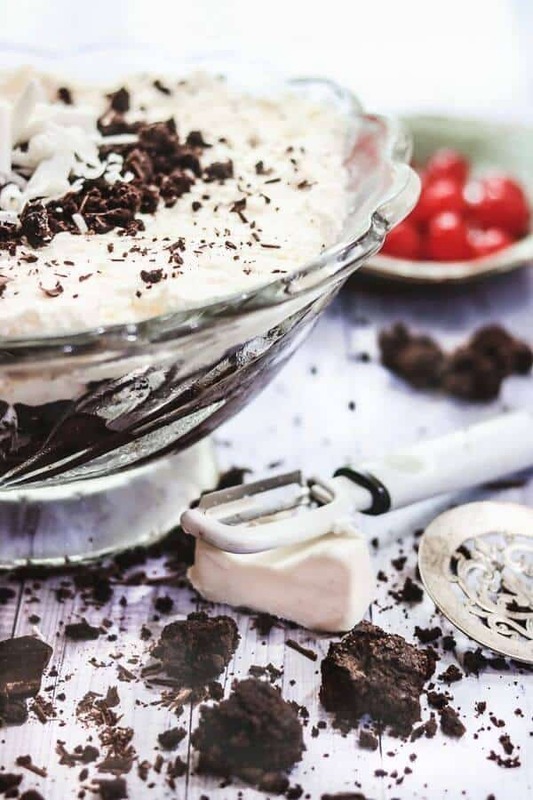 Whip the cream with the sugar and 1 teaspoon white chocolate pudding mix, or 1 teaspoon vanilla (the pudding mix will help stabilize it and make it last longer. Soften a white chocolate bar in the microwave until soft but not melted. Use a vegetable peeler to create shavings and curls - this takes a little practice! Soften a dark chocolate bar and prepare as for white chocolate shavings. Cut the brownies into small 2-inch cubes. Reserve 1 or 2 to make crumbs for garnish. Add about 1/2 of the cubes to the bottom of a punch bowl. Top with a the chocolate pudding. Top with half the toffee. Top with the cream cheese pudding. Top with the remaining toffee. Since this recipe has several variations the nutritional info is only an estimate based on about a 1/3 cup serving. This is not diet friendly!